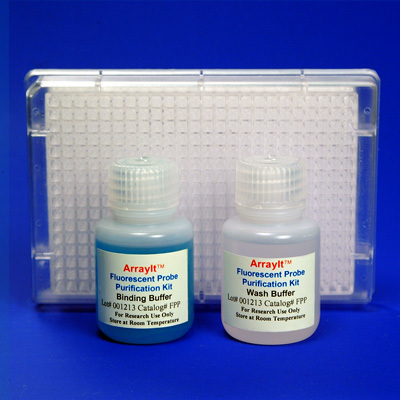 The ArrayIt Fluorescent Probe Purification Kits are an advanced purification system containing sophisticated separation buffers in a convenient 384 well kit. Use of our Purification Kit will increase the quality of your DNA microarray data by removing unwanted salts, enzymes, primers, unincorporated dyes and nucleotides, and other contaminants that diminish the quality of DNA Hybridization reactions. International pricing may vary by 10 to 20% due to costs associated with import taxes, duties, customs clearance and shipping.